George, B., Hammerschmid, G., & Van de Walle, S. (2019, accepted). Institutions or contingencies? A cross-country analysis of management tool usage by public sector executives. Public Administration Review. Fernández Gutiérrez, M. & Van de Walle, S. (2019). Equity or efficiency: Explaining public officials´ values. Public Administration Review, 79(1): 25-34. 10.1111/puar.12996 . Van der Voet, J. & Van de Walle, S. (2018). How cutbacks and job satisfaction are related: The role of top-level public managers’ autonomy, Review of Public Personnel Administration. https://doi.org/10.1177/0734371X15609409, 38(1): 5-23. James, O., Jilke, S., Petersen, C., & Van de Walle, S. (2016). Citizens’ Blame of Politicians for Public Service Failure: Experimental Evidence about Blame Reduction through Delegation and Contracting. Public Administration Review, 76(1): 83-93. Jilke, S., Van Ryzin, G. & Van de Walle, S. (2016). Responses to decline in marketized public services: An experimental evaluation of choice-overload, Journal of Public Administration Research and Theory, 26(3): 421-432. Moldovan, A. & Van de Walle, S. (2013). ‘Gifts or bribes? Attitudes on informal payments in Romanian Healthcare’. Public Integrity, 15(4): 383-399. Van de Walle, S. & Hammerschmid, G. (2011). 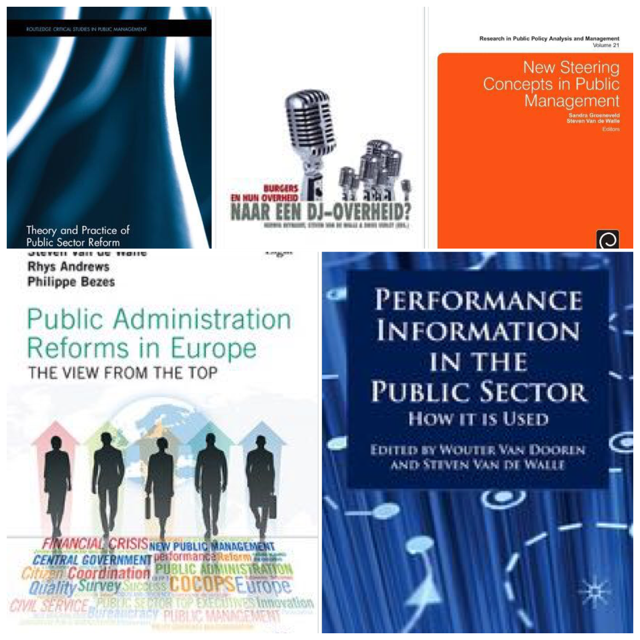 ‘Review essay: The impact of the new public management: Challenges for coordination and cohesion in European public sectors‘. Haldukultuur -Administrative culture, 12(2): 189-209. Groeneveld, S., & Van de Walle, S. (2010). ‘A contingency approach to representative bureaucracy: Power, equal opportunities and diversity’. International Review of Administrative Sciences, 76(2): 239-258. Van de Walle, S. (2010). ‘Building local communities: Place-shaping as nation-building’. Lex Localis – Journal for Local Self-Government, 8(1): 23-33. Van de Walle, S. (2009). ‘Confidence in the criminal justice system: Does experience count?’. British Journal of Criminology, 49(3): 384-398. Van Roosbroek, S., & Van de Walle, S. (2008). ‘The relationship between ombudsman, government and citizens: A survey analysis’. Negotiation Journal, 24 (3): 287-302. Van de Walle, S. (2008). ‘Comparing the performance of national public sectors: Conceptual problems’. International Journal of Productivity and Performance Management, 57 (4): 329-338. Van de Walle, S., Van Roosbroek, S., & Bouckaert, G. (2008). ‘Trust in the public sector: Is there any evidence for a long-term decline?’, In: International Review of Administrative Sciences, 74 (1): 45-62. Van de Walle, S. & Bouckaert, G. (2007). ‘Perceptions of productivity and performance in Europe and the USA’, In: International Journal of Public Administration, 30 (11): 1-18. Van de Walle, S. (2006). ‘The state of the world’s bureaucracies’. In: Journal of Comparative Policy Analysis, 8 (4): 439-450. Van de Walle, S., & Van Dooren, W. (2006). Guest editorial ‘The contingencies of performance measurement in the public sector’. In: International Journal of Productivity and Performance Management, 55 (6): 445-7. Kampen, J. K., Van de Walle, S., & Bouckaert, G. (2006). ‘Assessing the relation between satisfaction with public service delivery and trust in government: The impact of the predisposition of citizens toward government on evaluations of its performance’. In: Public Performance and Management Review, 29 (4): 387-404. Van de Walle, S. (2006). ‘The impact of public service values on services of general interest reform debates’, In: Public Management Review, 8 (2): 183-205. Van de Walle, S. (2005). ‘Peut-on mesurer la qualité des administrations publiques grâce aux indicateurs de gouvernance?’, In: Revue française d’administration publique, (115): 435-462. Thijs, N., & Van de Walle, S. (2005). ‘Administrative reform movements and commissions in Belgium 1848-2004’, In: Public Policy and Administration, 20 (4): 38-54. Gelders, D. & Van de Walle, S. (2005). ‘Marketing government reforms’, In: Journal of Nonprofit and Public Sector Marketing, 14 (1-2): 151-168. Van de Walle, S., Thijs, N. & Bouckaert, G. (2005). ‘A tale of two charters: Political crisis, political realignment and administrative reform in Belgium’, In: Public Management Review, 7 (3): 367-390. Bouckaert, G., Van de Walle, S. & Kampen, J. K. (2005). ‘Potential for comparative public opinion research in public administration’, In: International Review of Administrative Sciences, 71 (2): 229-240. Van de Walle S., Kampen, J. K. & Bouckaert, G. (2005). ‘Deep impact for high impact agencies? Assessing the role of bureaucratic encounters in evaluations of government’, In: Public Performance and Management Review, 28 (4): 532-549. Bouckaert, G., Laegreid, P. & Van de Walle, S. (2005). ‘Trust, quality measurement models, and value chain monitoring: symposium introduction’. Public Performance and Management Review, 28 (4): 460-4. Van de Walle, S. (2004). ‘Context-specific images of the archetypical bureaucrat: persistence and diffusion of the bureaucracy stereotype’, In: Public Voices, 7 (1): 3-12. Bouckaert, G. & Van de Walle S. (2003). ‘Comparing measures of citizen trust and user satisfaction as indicators of ‘good governance’: Difficulties in linking trust and satisfaction indicators’, In: International Review of Administrative Sciences, 69 (3): 329-344. Also in French as: Van de Walle, S. & Geert Bouckaert (2003). Comparer les niveaux de confiance des citoyens et de satisfaction des utilisateurs en tant qu’indicateurs de ‘bonne gouvernance’, In: Revue Internationale des Sciences Administratives, 69 (3): 363-400. Van de Walle, S. & Bouckaert, G. (2003), ‘Public service performance and trust in government: the problem of causality’, In: International Journal of Public Administration, 29 (8 & 9): 891-913.